The BBQ season is fast approaching and with it comes a growing number of invitations to the ubiquitous BBQ where everyone brings something - my first is tonight. As much as I am a fan of the deluxe green salad, it usually wilts pretty fast if dinner spreads over a couple of hours and left-overs really aren't all that appealing. So unless there is a fixed time for dinner, if I am on the list for salad I tend to bring either a veggie tray, a fruit tray or one of a number of salads that travel well. Growing up in South Dakota many years ago, the potluck was a tradition. 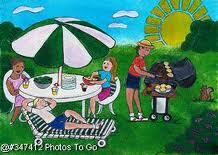 From the summer one in the park with the entire congregation, to back yard family BBQ's, the variety of easy-to-bring recipes were endless. Fresh produce wasn't as available, so there were many forms of "salad" that didn't need lettuce, travelled well and the left overs could be eaten for a couple days. I still remember Traditional 3 Bean Salad made with rinsed canned beans and sliced onion. Then there were the jello salads with celery or fruit in them or one jello concoction called Ambrosia (more reminiscent of dessert than salad) that you can still get from the deli counter in Aberdeen, S.D. A unique one I haven't seen since childhood was pea salad - mainly peas and cubes of sharp cheddar cheese with mayo that actually tasted pretty good. 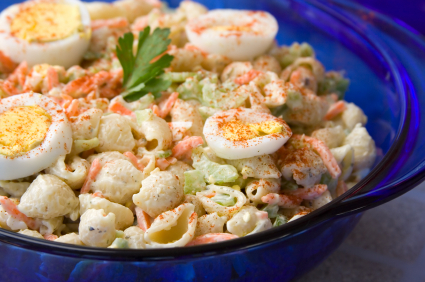 Macaroni salad was a definite 4th of July tradition right along with apple pie. Over time, fresh produce became more widely available and affordable and potluck salad recipes went through a metamorphosis - at least on the West Coast. There are now many recipes for marinated vegetable salads that are delicious. Most have you blanch or partially cook vegetables such a broccoli, cauliflower and carrots, rinse in ice cold water and then drain until completely dry. If you like you can toss with other ingredients such as mushrooms, shallots, marinated artichokes and fresh herbs, or leave it simply as is. Then add any oil and vinegar dressing you like. Pasta salads have also become more popular and have a similar cook-toss in a few extra ingredients-add vinaigrette preparation. I personally am still a huge fan of the macaroni salad - it's comfort food from my childhood - but have chosen to up the ante a little. Probably the most traditional version is simply cooked elbow macaroni with chopped up hard boiled eggs, diced onion and celery and mayonnaise. For my version I wanted a lot more eye appeal, flavours and crunch, plus a little less mayo. So here is the current list of what I put in mine. As with most of the recipes I share, it's just a starting point for you to develop your own unique version. This needs to be made either in the morning or the night before so it has a chance for the flavours to mix and mingle. Either 2 stalks celery diced or 1/2 of a long English cucumber diced. salt, pepper and herbs if you like (I enjoy a bit of Thyme or Dill - but usually just go with salt and pepper). Fill a really large pot full of cold water and add eggs. Put on burner and bring to a boil. Add small shell pasta and give a quick stir. Turn down heat slightly so it doesn't boil over and cook according to time indicated on package - usually 7-9 minutes for small shell pasta. Remove the eggs and set aside to cool. Drain pasta and rinse under cold tap water until cool to the touch. Set aside to drain. Place the pasta, onion, pepper, carrot, tomatos and celery or cucumber in a large salad bowl. Add herbs if you like and a small amount of salt and pepper (you will adjust just before serving so use a light hand.) Drizzle in some vegetable oil - I use this to keep thing the salad moist and to reduce the amount of mayonnaise necessary. Unfortunately I kind of eye this - but probably 2-3 Tablespoons. Add 1/2 cup mayonnaise and stir until really well mixed. Then add more 1/4 cup at a time until it has the consistency you want. Just be sure it is well-mixed before you add more and try to err on the side of too little. More can be added just before serving when you adjust the seasoning. Diced hard-boiled eggs are added after they have cooled. About an hour before serving time, I check if the salad needs more salt or pepper and adjust to taste. This is also where I add more mayo if it seems a bit dry. So whether a BBQ, a picnic in the park or a balcony get together, it's time to step out of the box and experiment with some other salad choices. You can be sure any left overs will quickly be eaten up the next day - that is if you have any left-overs.